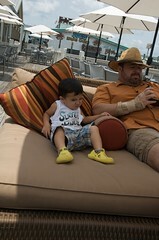 It was our last day of vacation and we decided that we head to the Kemah Boardwalk as it is on the way home. 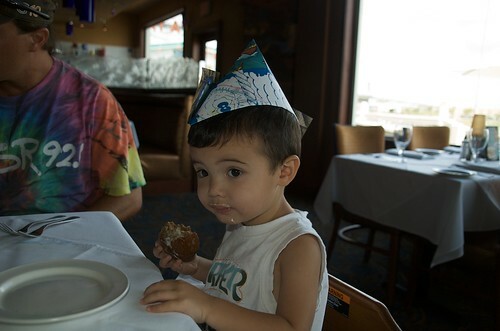 We tried to eat lunch in Galveston, but the restaurant we chose was closed so we headed on to Kemah. When we arrived and parked, we ate at the first restaurant we saw on the boardwalk, The Chart House. I should have known when we walked in that it was going to be way to pricey, but we were already committed. We had to wait about 5-10 minutes while they set up our table. 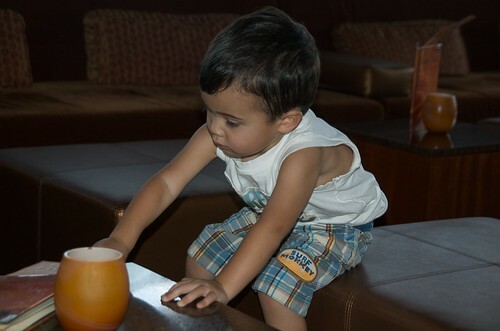 The kids enjoyed the “lounge” area, but I did not enjoy making sure that Benji was not going to throw one of the glass candle holders at any second. I was very glad to move on to our table in the restaurant. 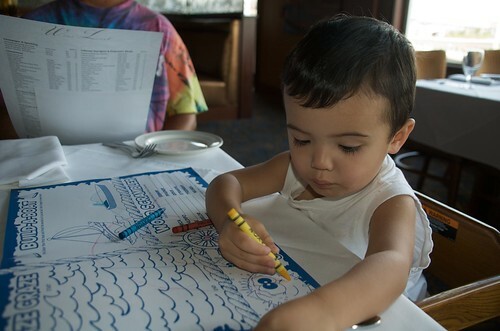 We all got settled and the kids got their menus and coloring activities. I sat with Benji on one end and Mina sat at the other end of the table engrossed in the activities on the page. Benji actually colored, too and after we ordered, Tony who sat across from me, made him a hat and a boat out of his paper. We had to keep redirecting Benji who wanted to (and did) color on the tablecloth. Doh! At one point, while waiting, I had Ogre take the kids outside to see the boats coming out and Kaili and Adrienne joined them to pass the time. 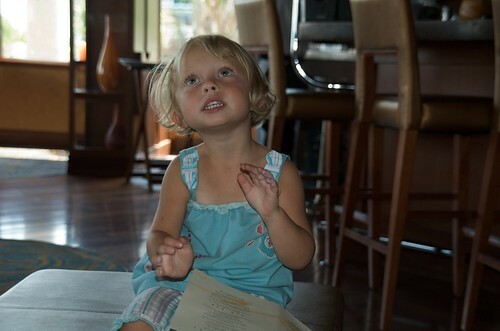 We got our appetizers and bread, which was nice to keep ourselves and the kids entertained while we waited on our food. Just as we started to audibly wonder about the whereabouts of our food, our food showed up. We all ate and the kids were pretty well behaved. 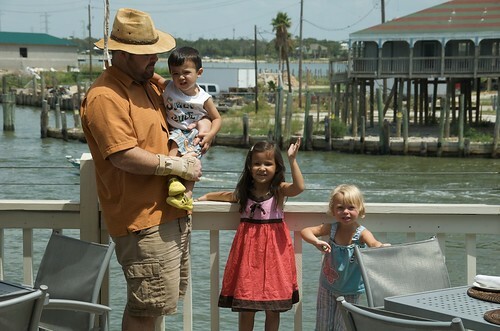 After we ate, it took awhile to get the check and pay up, so I had Ogre take the kids out again to the deck while I paid up. We ordered two appetizers: the coconut shrimp and some kind of olive oil infused shrimp with a lemon custard. Everyone thought the coconut shrimp appetizer was excellent. The shrimp on both appetizer dishes were nice and jumbo sized. I ordered lobster bisque and the lobster spring rolls as my lunch. The lobster bisque was pretty good, it had nice sherry undertone to it and has large pieces of lobster in it as well. It’s no French Room lobster bisque, but those are pretty big shoes to fill. The lobster spring rolls were also pretty good, but it made for a heavy lunch -I anticipated more of a fresh wrapper, but it was more won-ton like. It’s lobster and cabbage inside a deep fried egg roll. It is served with a “spicy mustard,” it almost tasted like mustard and wasabi. Pretty nice combo. Ogre ordered sea scallops with coconut ginger rice, bok choy and spinach. The sea scallops are glazed with a soy-ginger sauce. The scallops were nice and meaty, but they were overcooked (I actually prefer them overcooked, so I liked his a lot). He also liked the coconut ginger rice that accompanied the scallops. Adrienne ordered the Flounder, grilled with an avocado lump crab topping. She thought it was really good also. She did not like the coconut ginger rice as she thought it tasted to soggy and over cooked. Tony ordered the French Dip (minus onions) and he also thought this was very good. Don ordered a Cheeseburger and did not finish his, but did not say that it tasted bad, just that he was full. The kids ordered a cheeseburger also and while they seemed to like it pretty well, it looked a little overdone to me. Not stellar. Very slow on the drinks and the food coming out was very slow also. Maybe this is typical for this restaurant, but at lunch? on the Boardwalk? with two families? I had to help the waitress think outside of the box, she kept “refilling” Ogre’s tea glass with more and more ice so he would only get a sip of water with each refill. How about not using the same ice filled pitcher and just getting him a glass of tea with no ice to refill his own drink? They do have kids activities and kids menu items, but it’s a somewhat upscale restaurant so it’s kid friendly, but not laid back. 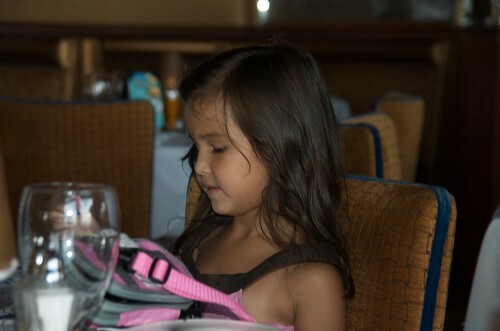 I think if your kids are pretty well behaved and they are patient, you are fine bringing them here for lunch or dinner. A little too pricey for my taste especially for lunch, maybe a better spot for dinner.